Offered by the United States Mint as the second of five 2013-dated strikes of a series of five ounce silver coins is the 2013 Perry's Victory and International Peace Silver Uncirculated Coin. Shown on the reverse of the strike is a design emblematic of Perry's Victory and International Peace Memorial located in the state of Ohio. That design is also featured on two other series of strikes from the United States Mint including the America the Beautiful Quarters® Program and the America the Beautiful Bullion Coins. All three series feature the same basic obverse and reverse imagery including an obverse portrait of George Washington and a reverse design emblematic of a selected site of national interest from around the United States and its territories. Strikes of the America the Beautiful Five Ounce Silver Uncirculated Coin™ series are composed of five ounces of .999 fine silver and feature a diameter of three inches. These are also the same basic specifications as used for the related bullion coins. However, whereas the bullion coins are struck for investors, these silver uncirculated coins are produced for collectors. Perry's Victory and International Peace Memorial of Ohio was initially established in 1919 after ownership was assumed by the federal government from a multi-state commission. The memorial is unique for the fact that it both commemorates a war (the War of 1812) as well as the peace that has remained between the warring parties since (United States, Canada and Great Britain). A portrait of George Washington, the first President of the United States, is shown on the obverse of all America the Beautiful related coins. It was originally designed by John Flanagan and featured on the 1932 circulating quarter dollar. Obverse inscriptions include UNITED STATES OF AMERICA, LIBERTY, IN GOD WE TRUST and QUARTER DOLLAR. A 'P' mintmark may also be found on the obverse indicating the coin was produced at the US Mint's facility in Philadelphia. 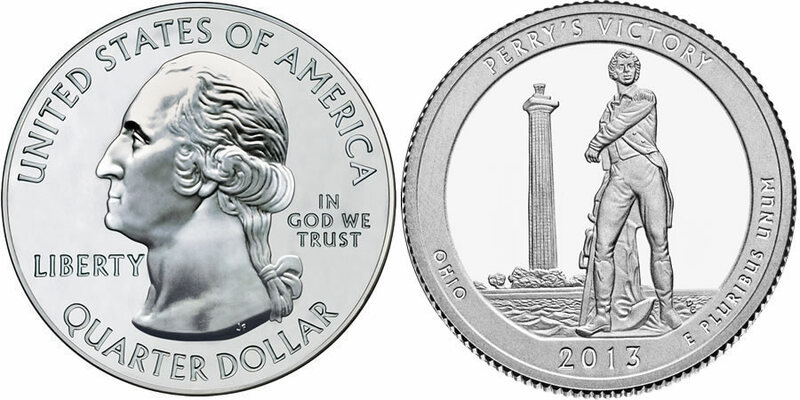 The reverse of the coin contains the design emblematic of Perry's Victory and International Peace Memorial. Reverse inscriptions include PERRY'S VICTORY, OHIO, 2013 and E PLURIBUS UNUM. An edge inscription of "999 FINE SILVER 5.0 OUNCE" is used to indicate its weight and fineness.